After a series of fiscal crises over the past few years, the public is not expressing a particular sense of urgency over the pending March 1 sequester deadline. With little more than a week to go, barely a quarter have heard a lot about the scheduled cuts, while about as many have heard nothing at all. And if the president and Congress cannot reach a deficit reduction agreement before the deadline, 40% of Americans say it would be better to let the automatic spending cuts go into effect, while 49% say it would be better to delay the cuts. Both Republicans and independents are divided evenly over which approach is better, and even among Democrats, roughly a third favor letting the sequester take effect over any delays. The new survey, conducted Feb. 13-18, 2013 with 1,504 adults nationwide, is the first in a collaboration between the Pew Research Center and USA TODAY. It finds that, as with previous conflicts over the debt ceiling and fiscal cliff, Obama holds the upper hand politically over congressional Republicans. If there is no deficit deal by March 1, 49% say congressional Republicans would be more to blame while just 31% would mostly blame President Obama. Moreover, 76% say that the president and Congress should focus on a combination of spending cuts and tax increases to reduce the budget deficit. Just 19% agree with the current Republican position that tax increases should be off the table. And while Obama’s 51% job approval rating is down slightly from a post-election high of 55%, it remains well above the 25% approval rating for GOP congressional leaders. The job rating for Democratic leaders is higher (37%), though more disapprove (55%) than approve of their performance. 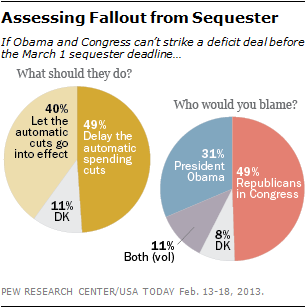 The poll finds new evidence of the public’s concern over the federal budget deficit. Fully 70% say it is essential for the president and Congress to pass major legislation to reduce the federal budget deficit, including wide majorities across party lines. Last month, the Pew Research Center’s annual policy priorities survey found a sharp rise in the percentage rating deficit reduction as a top priority since 2009. Far fewer say it is essential to act on three other issues that Obama mentioned prominently in his State of the Union address: 51% say it is essential for the president and Congress to act on major immigration legislation; 46% view major gun legislation as essential; just 34% say it is essential to set new federal policies dealing with climate change. 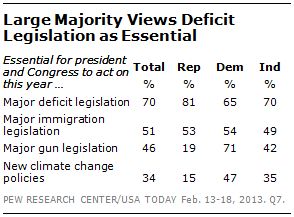 There are wide partisan differences in attitudes about all four issues. This also is the case in views about whether to raise the minimum wage, another proposal Obama raised in his State of the Union. By a wide margin (71% to 26%), the public favors increasing the minimum wage from its current level of $7.25 per hour to $9.00 an hour. But while large majorities of Democrats (87%) and independents (68%) favor raising the minimum wage, Republicans are evenly divided (50% favor, 47% oppose). Among all Republicans and Republican-leaning independents, those who agree with the Tea Party oppose the proposed minimum wage hike by two-to-one (64% to 32%). 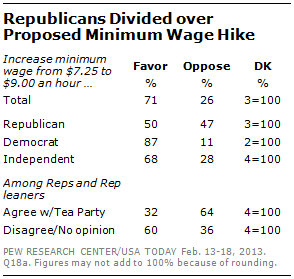 Those who have no opinion of the Tea Party, or disagree with it, favor increasing the minimum wage by 60% to 36%. A substantial majority of Americans (76%) feel that both spending cuts and tax increases should be a part of the next step in tackling the federal budget deficit. But an equally large proportion believes that the greater share should come from spending cuts, even if tax hikes are also considered. Overall, 19% say the focus of deficit reduction efforts should be only on spending cuts; just 3% want to concentrate only on tax increases. About four-in-ten Republicans (42%) favor reducing the deficit with spending cuts alone; that compares with 18% of independents and just 6% of Democrats. 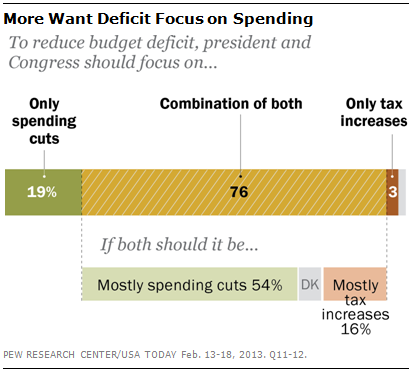 Even among Republicans, more favor a combination of spending cuts and tax increases to just spending cuts (56% vs. 42%). When those who favor a balanced approach to reducing the deficit are asked if the focus should mostly be on spending cuts or tax increases, they overwhelmingly say spending cuts. Overall, 73% say efforts by the president and Congress to reduce the deficit should be only or mostly focused on spending cuts while just 19% say the focus should be only or mostly on tax increases. Nearly half (47%) say the priority for illegal immigration is better border security, stronger law enforcement and creating a way for people here illegally to become citizens if they meet certain requirements. 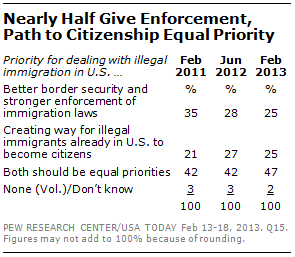 Just a quarter (25%) favors an enforcement-only approach while an identical percentage says the focus should only be on a so-called path to citizenship. The percentage favoring a dual approach to immigration policy has risen modestly since June, from 42% to 47%. Republicans are more likely than Democrats to say that better border security and stronger enforcement of immigration laws should be the bigger priority, while Democrats are more likely to want the focus to be on creating a way for illegal immigrants already here to become citizens if they meet certain requirements. Obama holds a sizable advantage over congressional Republicans on immigration. Half (50%) say that Obama has a better approach to dealing with immigration, compared with 33% who say congressional Republicans have a better approach. Obama’s job approval in handling the nation’s immigration policy, in negative territory for most of his presidency, also has improved. Currently, about as many approve (44%) as disapprove (43%) of Obama’s handling of immigration policy; in seven surveys since 2009, far more disapproved than approved. Hispanics, in particular, are much more positive about Obama’s job performance on immigration: 63% approve currently, up from just 28% in November 2011. Gun control and climate change are potentially even more divisive political issues. For Democrats, 71% say it is essential that the president and Congress pass major gun legislation this year – that is slightly higher than the number saying major deficit reduction legislation is essential (65%). But just 19% of Republicans place the same emphasis on gun legislation. Nearly half of Democrats (47%) view action on climate change as essential this year, compared with 15% of Republicans. Americans remain divided over whether it is more important to control gun ownership (50%) or protect the right of Americans to own guns (46%), with no significant change in attitudes in the two months since shortly after the Newtown shootings. Similarly, there has been no change in public views about banning high capacity clips (53% favor), banning assault weapons (56% favor), or broader background checks (83% favor).